Splints manifest themselves as swellings and bony enlargements located on the splint bones on both forelegs and hindlegs of horses. Avoid excessive concussion and strain especially with young horses. Feed nutritionally balances grains and forages especially to young horses. Alfalfa is a good feed. However, it is best to feed alfalfa only in grass mixtures to rapidly growing horses. Fresh splints are best treated topically with Silver Splintex t.m. and gauze or cotton bandage. (Leg brush included.) Elimination of the fresh splint may occur as early as 3 five day cycles, although some cases require additional treatment. Horses with hot splints should receive lay-up or complete rest with exercise limited to hand walking. 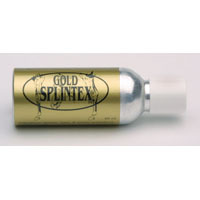 Cold splints are best treated topically with Gold Splintex t.m., bandaging optional. (Leg brush included). At approximately 20 days the enlargements appear to flatten with dramatic reduction of the splint as early as 30 days. Treatment should be continued to achieve complete elimination. Horses with cold splints may follow their daily routines without interruption unless lameness is present.